The visitors never looked back after Stephane Bahoken opened the scoring inside two minutes while further goals from Dimitri Lienard and Martin Terrier sealed a comprehensive 3-0 victory. Bahoken broke through on goal in the opening moments with a touch that took him past Bordeaux defender Vukasin Jovanovic before coolly slotting into the net. Lienard doubled Strasbourg's advantage seven minutes before half-time by curling a left-footed free-kick beyond Girondins goalkeeper Benoit Costil. Any hopes of a Bordeaux comeback in the second half were undone by their poor defending, with Terrier racing the length of the pitch - almost in a straight line down the centre - and side-footing past Costil in the 64th minute. 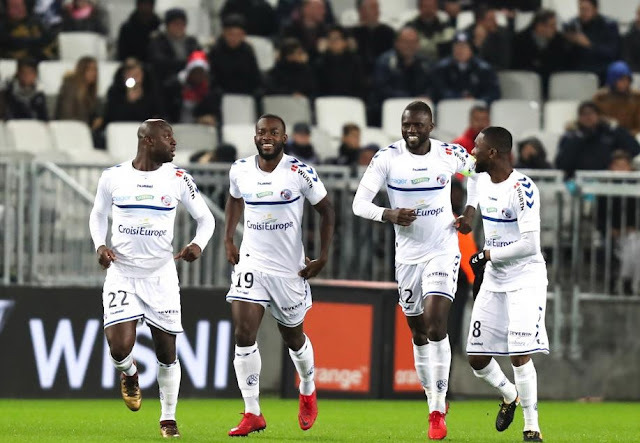 Strasbourg extended their unbeaten streak to five matches, with three wins, while Bordeaux have lost seven of their last 10 top-flight games.